It was more or less inevitable that someone, one day, would make a live action Pokemon movie. Talk of such a thing has been doing the rounds since the late 90s when the franchise was at its cultural peak, but now it’s finally happening. And it’s taking the form of…a loose adaptation of a 3DS spin-off where Pikachu is a detective. Voiced by the Deadpool guy. I’ll say this for it, the Pokemon designs don’t look nearly as horrifying in motion as they do in the still images that have been doing the rounds on Twitter. That isn’t going to stop me from making fun of them. In case you missed all the Deep Lore Connections in that trailer, the idea seems to be that this is indeed taking place in the world of the Pokemon games—it’s not people from the real world going to Pokemon land or Pokemon arriving from another dimension or something—except that instead of the cartoony, vaguely stereotyped locations of the games and anime, the world of Pokemon looks like…well, our world. But with Pokemon. On one hand, this is actually kind of neat. The games and associated spin-offs have a very simplistic art style that would be pretty hard to recreate in live action without coming off as cheap, and seeing Pokemon walking around in a realistic, grounded environment does capture some of the imaginative magic of the original games. To kids playing through the recent games for the first time, this is probably mind-blowing. Did you think there was going to be an exploding car in the first live action Pokemon movie? Is “explosive, deadly car crash” the first thing that comes to your mind when you think of the Pokemon franchise? And then there’s the Pokemon themselves. Now, look. This was never going to be easy. Pokemon are bright, colourful, extremely unrealistic cartoon characters; they were never meant to be rendered in multi-million dollar CGI alongside real sets and actors. As the many realistic Pokemon fan art projects will attest to, attempting to translate the character designs to a biologically plausible form inevitably leads to the stuff of nightmares. There are multiple approaches anyone handling this project could take. You could still chase realism, consequences be damned. You could render the Pokemon almost like living stuffed animals, acknowledging their nature as cuddly virtual toys for kids. Or you could aim for a more stylized look, imagining the Pokemon almost as animated models. Or—and here’s a wild idea—you could go for all three. Simultaneously. Gaze at them, and now that humanity has reached the limits of its creative potential. (All pictures stolen from this Gamespot article because I’m lazy). First we have Pikachu himself, with his adorable little detective hat. He looks…fine. He’s probably the best looking of the Pokemon, especially when you see him in motion and he’s scooting around on his little stumpy legs. But then you look deeper and you see the strange mish-mash of elements I talked about earlier. The eyes are photo-real and look like something that could exist in a real animal, as do the creases on the forehead. But the fur is a shade of bright, neon yellow that doesn’t exist in nature, and the cherry-red cheek circles look like they were applied with dye. And the less said about the tail, the better; you can’t make it out in this shot, but it looks like something someone made out of felt and a coat hanger. Again, it’s like he’s part animal and part hand-made doll that’s come to life. Look at Psyduck. Look at him. This is a Pokemon I identify with strongly since he appears to be having a constant migraine, and they gave him giant, photo-realistic silver irises that you can see light glinting off of. And then the beak is some sort of claymation sculpture. It’s like someone made a Psyduck model and then jammed a pair of preserved giant squid eyes into it. 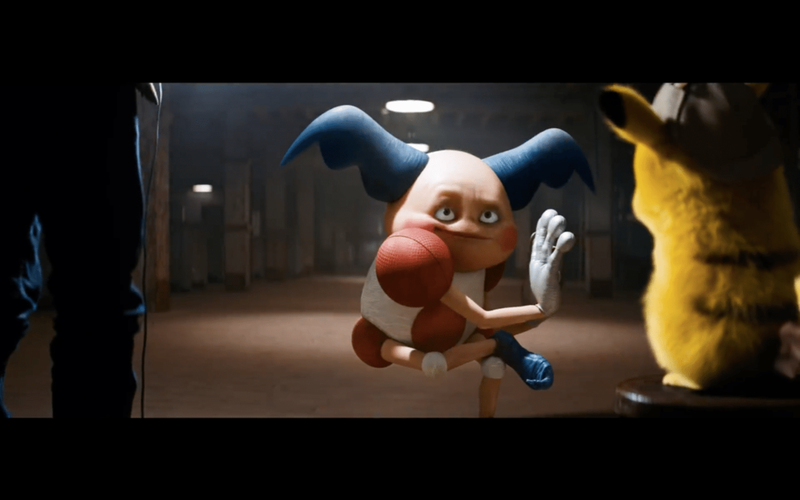 When I saw pictures of this Jigglypuff going around, I thought it was the most terrifying Pokemon from the trailer. I was wrong—that’s coming up in a second—but dear God, it was close. And then, finally, we come to Mr. Mime. Or, as he shall now be known, Mr “looming over your bed at 3 am” Mime. In terms of design, he might be the most faithful Pokemon of the lot. He looks exactly as he does in the game. But…something isn’t right. His flesh looks too much like human skin. The creases and folds on his hand-gloves are deeply alarming. And the designers had to try and decide what those blue things coming out of his head are made out of, apparently deciding on denim made out of cured elephant skin. I think my main problem, apart from the stark horror of these images, is that they look like CG creatures. And by that I don’t mean they look like CGI creations added to the movie in post-production—that’s what they are—I mean that in the universe of the film, diagetically, they look like CG cartoons that somehow crawled out of a TV screen, Who Framed Roger Rabbit style. But they’re not supposed to be cartoons. They’re supposed to be real, living animals. Now don’t get me wrong, I’m not actually outraged at all of this, partially because I don’t have any lasting nostalgia for the franchise and don’t care what they do with it, but also because the movie…actually looks pretty good. Like I said, the Pokemon are much more palatable when they’re moving, and the main character being the only person who can understand Pikachu (and more specifically the gag that he sounds like Ryan Reynolds to the protagonist but makes the anime “pika pika” noises to everyone else) is both interesting and pretty hilarious. The humour, despite being the quip-heavy style of comedy that’s so prevalent in family entertainment these days, actually seems decent, judging by the trailer. So no, I don’t hate Pokemon: Detective Pikachu or whatever it’s called, nor am I being entirely sincere when I describe the CG Pokemon as looking like beings from an eerie Silent Hill-esque hell dimension. I still think it’s weird that the first Hollywood Pokemon movie is about solving Poke-crimes instead of a Pokemon trainer going on a Poke-journey, but I’m sure the sequel will get around to that. I guess my closing point is that it increasingly feels like as CGI has advanced, movie creators have become less and less able to use it to good effect. I’m thinking specifically of atrocities like the nightmarish Teenage Mutant Ninja Turtles movies, or that upcoming Alita movie where she had giant anime eyes. Still, at least Hollywood hasn’t totally lost its way. At least they’re not making a Sonic The Hedgehog movie. We've got the first pictures of James Marsden as TOM THE COP!